Angel Hair Cypress is an evergreen shrub that has light green, soft feathery foliage that will retain its color through the winter. It will grow to a height of 5' to 6' tall and just as wide. Plant in full sun and well drained soil. 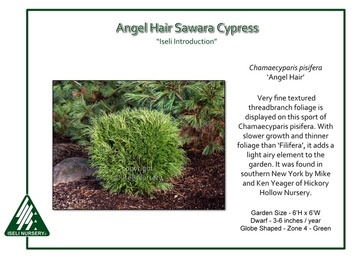 Angel Hair Cypress makes a great Rock Garden or Miniature Garden shrub due to its slow growth habit. You can even use this shrub as a Bonsai plant. Angel Hair Cypress will also do well in a container. It is also deer resistant.